These training course materials focus on the essential elements of coaching and will give participants a strong grounding in the best practice requirements of coaching and ensure they are capable at applying this critical development intervention. The materials are required training for anyone involved in the coaching process. These course materials will help you address this concern, by providing all of the essential elements required to give participants a strong grounding in the core requirements of coaching. 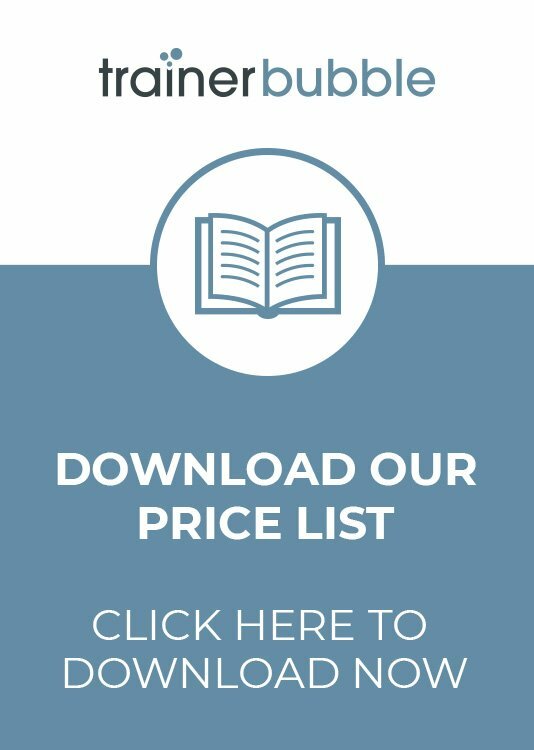 It provides advice on best practice in the coaching world, looking at the methods used to get the best out of those being coached and how to ensure they are challenged and set action-focused goals. Why is running this coaching essentials course a good idea? 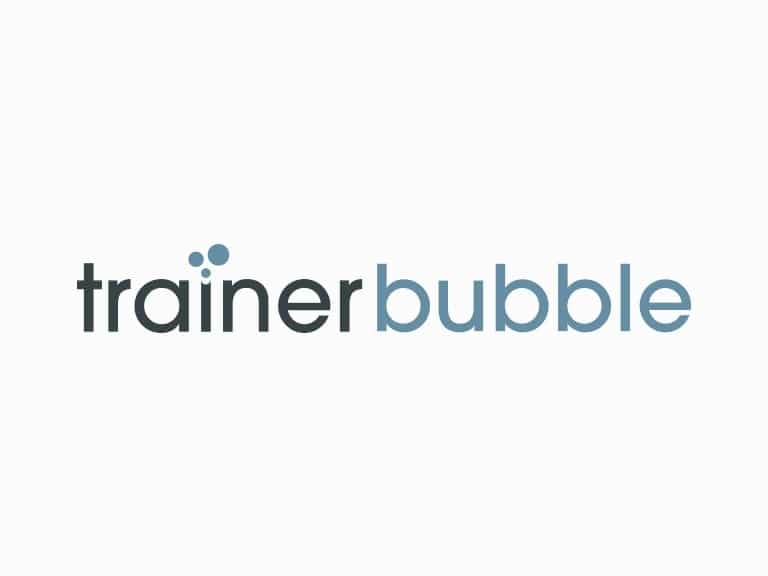 Ultimately these training course materials allow you to nurture a coaching team that is better able to effectively coach those around them, ensuring all employees develop and consequently assist the organisation in meeting its business goals. 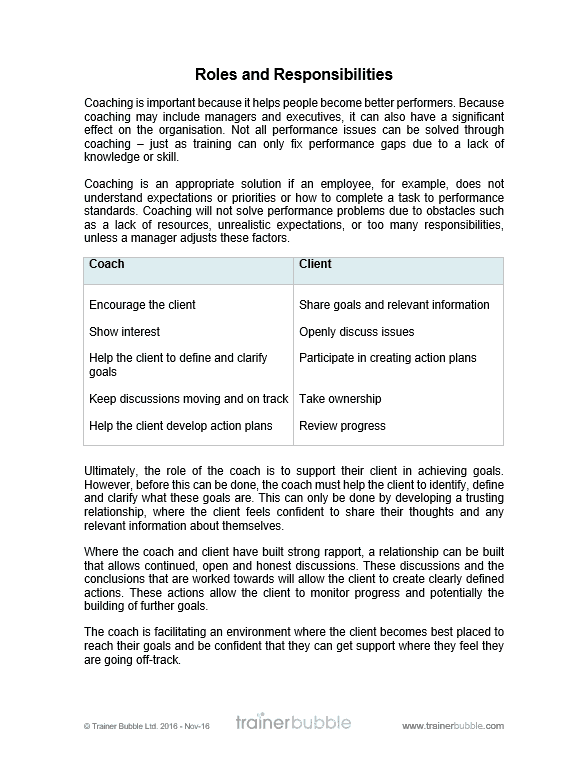 These Coaching Essentials training course materials will help develop your participants coaching skills and ensure they understand how people learn and how this should influence the way they coach them. They’ll learn what it takes to be a successful coach and how best to ensure the people they coach create meaningful development actions that get results. 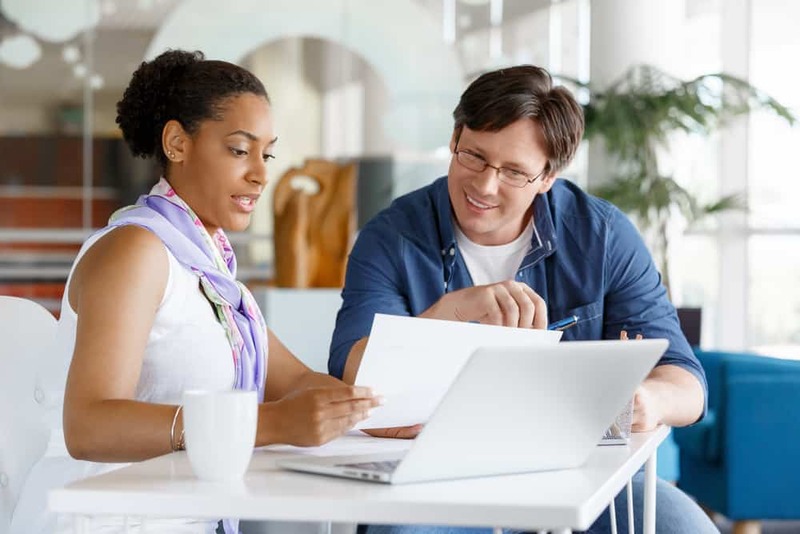 Understanding employee support and development – Identifying the different developmental support available to employees and establishing when best to use each type. Understanding coaching – Define what coaching is, when and why it should be used and the core skills of an effective coach. Bringing about change – An identification of the different levels of change using ‘Hargroves – Masterful Coaching’, what this means during personal development and how to implement; incremental, fundamental and transformational coaching. 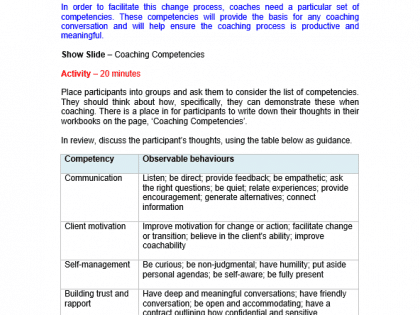 Coaching competencies – Recognising the competencies required for effective coaching, what the observable behaviours are and how to apply them. 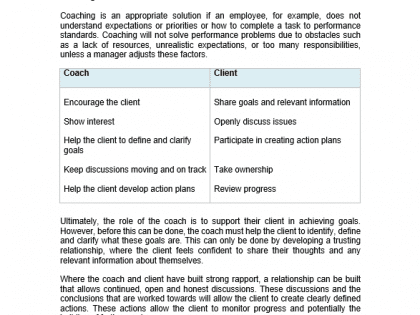 Roles and responsibilities – Establishing the roles and responsibilities of both the coach and the client during the coaching process. 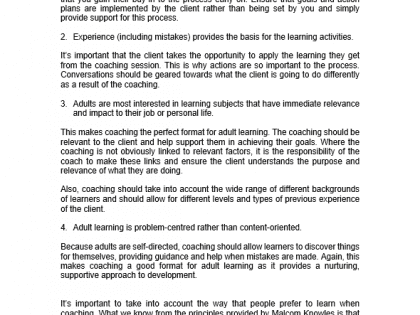 How adults learn – Using Malcolm Knowles ‘characteristics of adult learners’ to describe the four principles of adult learning and then reviewing how to apply this knowledge to coaching. The stages of learning – Describing the stages of learning (unconscious incompetence, conscious incompetence, conscious competence and unconscious competence) and using it to impact coaching sessions. Learning styles – Identifying the different learning styles and adapting their own style to meet the needs of the client. Includes a learning style questionnaire to identify their own style. Motivation – Describe what motivates individuals and how to find solutions to lack of motivation (includes TED talks video clip). Case study to apply learning. Questioning techniques – How to use different types of questions to get the best out of the coaching session. Active listening – Identifying active listening skills and then applying and demonstrating this learning through an active listening activity. Giving feedback – Understand the different feedback types and how to give effective feedback. The GROW model – Review this popular coaching model in preparation for applying it to their own coaching session. 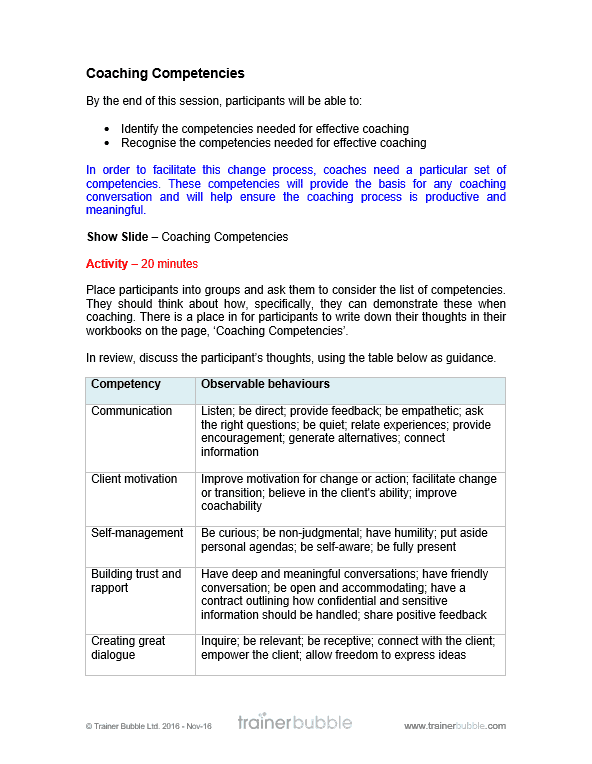 The Benning model – Describe the stages of the coaching conversation using the Benning model in preparation for applying it to their own coaching session. 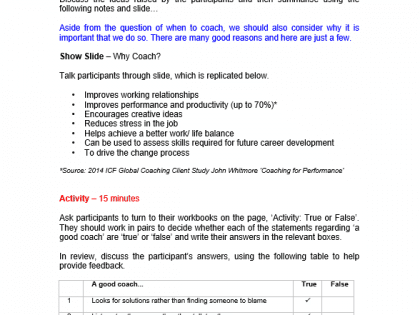 Coaching practice session – A chance to apply the learning from the training course with full observation and review.